Unsatisfactory static & dynamic run-out of the blade. Overheating of the blade during operation. Dulling of the blade cutting edge. Unsatisfactory alignment of the CBN grinding stones. Inadequate lubricant adjustment leading to gumming of grinding stones. The inherently low coefficient of friction of EXO results in reduced friction forces between the body of the saw and the work-piece (the tissue/paper log). In addition, the unique nodular structure of the EXO coating not only provides minimal contact area between paper and blade (thereby reducing friction), the large surface area also assists in increasing the heat dissipation rate. A combination of the above factors, keep the blade surface cooler than that for conventional blades, resulting in improved dynamic run-out and mechanical stability of the saw. By reducing blade temperature, EXO minimizes blade distortion and allows more stable, precise cutting. EXO also helps blades to maintain an optimal edge bevel for a longer period of time. The result is that operators can eliminate crushed cores and biased cuts by achieving more consistent cut quality. Our blades are engineered for a long service life, starting with the finest alloy tool steel. 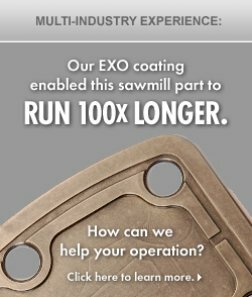 The EXO coating gives these blades extreme surface hardness and lubricity, so that they operate longer, with fewer tool changes, and minimal downtime. Some sort of lubrication is commonly used on the body of the blade to reduce friction forces. However, this lubricant can frequently gum up the grinding wheels reducing their efficacy and eventually leading to dulling of the cutting edge. Also, lubricant contamination can transfer to the tissue rolls, increasing the % of ‘broke’ rolls. EXO log-saw blades with a ‘lubricious’, low coefficient-of-friction surface can significantly reduce lubrication consumption and all of the associated drawbacks of using lubricants. EXO blades enhance operator safety by keeping personnel safely outside of the saw box as much as possible. Since EXO coated blades require fewer tool changes, operators spend less time inside the saw box changing saws and grinding wheels. Lubrication Operators who eliminate lubrication also eliminate the lubricant buildup, which reduces housekeeping and maintenance tasks. UCT offers more than just blades to tissue manufacturers. Through our subsidiary, International Knife and Saw, we also provide the expertise that enables customers to improve their processes and increase efficiency. We can train personnel in best practices for benchmarking performance, implementing repeatable procedures, and other efficiency techniques. The net result is a competitive advantage that compounds the benefits our high-performance saw blades. EXO log saws blades engineered and manufactured specifically to work in conjunction with a proprietary inter-metallic coating, possess a protective surface that facilitates a major reduction in friction – which in turn leads to a significant decline in blade surface temperatures when operating at higher blade speeds. The plating’s unique thermal management property allows operators to maintain consistent cut quality while enjoying increased blade life, extended grinding stone life, reduced lubrication requirements, and overall improved blade performance. 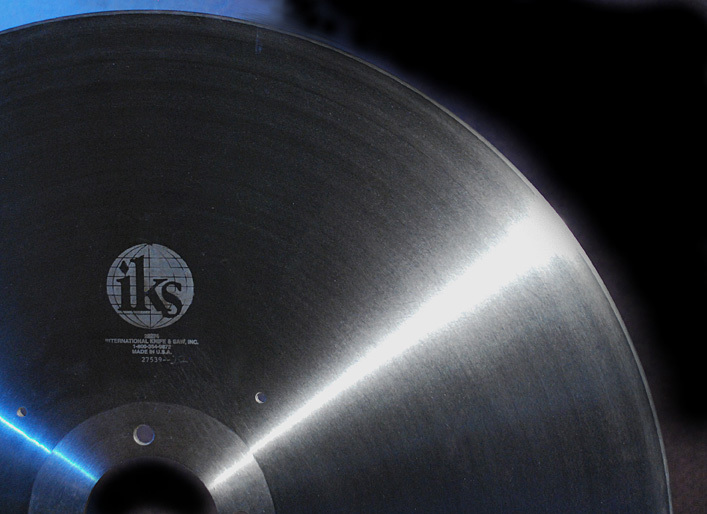 For more information on International Knife and Saw (IKS), please click here.